Thought it was long overdue to say hi on here! I've been following things on the KFF forum for a couple of years but not so much recently but I've now found you all on here! I'm a bedroom, home office/study designer but also can do living rooms, media centres etc. 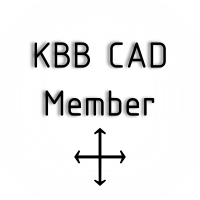 I would say I'm pretty experienced on Articad having used it for around 7 years (I hope to post up some of my design images for you to look at) but I trained on Autocad and 3D studio Max at uni. I hated Autocad so I did all my 3D design work in Rhino which I haven't touched for over 10 years (except the one time I had to draw up a swimming pool to show a client how their tile choice would look!!!). I'm pretty handy in photoshop and sketchup as well! Re: Hi - a long time follower on KFF! Hi Jon, nice to meet you, would love to see some of your work! Other software now has caught up with its power in many areas now.... Not really a piece of software your could use for dimensioned plans etc though unless they have addressed that? I stopped using 3D Studio Max 13 years ago when I left uni and haven't touched it since! I'll have to hunt out some old hard drives with my uni work on and take a look! I dabbled with Blender back then as well as Flamingo (when I was using Rhino a lot!). Other software has caught up and what I can do in Articad is so streamlined (barring the odd hiccup here and there!). What got me into 3D software was a free version of Amapi 3D on a Computer Arts magazine when I was teenager! I used it to create abstract artwork back then rather than creating anything realistic! Jon_Griffiths wrote: I stopped using 3D Studio Max 13 years ago when I left uni and haven't touched it since! I'll have to hunt out some old hard drives with my uni work on and take a look! I dabbled with Blender back then as well as Flamingo (when I was using Rhino a lot!). Other software has caught up and what I can do in Articad is so streamlined (barring the odd hiccup here and there!). 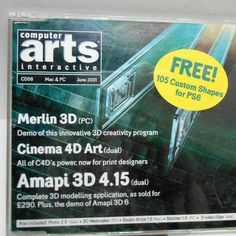 What got me into 3D software was a free version of Amapi 3D on a Computer Arts magazine when I was teenager! I used it to create abstract artwork back then rather than creating anything realistic! Blimey!! Pretty sure I used an earlier version of Amapi 3D (in the 90's)! I should still have this copy and CD in my folks loft or somewhere! I had forgotten the quirky GUI on the right! !